AFTER A YEAR of planning, carrying 100 pounds (45kg) of materials from New York to the island of Itaparica, and cutting and soldering 700 pieces of glass, the time for installation has arrived. I have about 10 days left in my residency so I am more than eager to have Our Lady in her final, very lofty location. One change of plans it to attach the glass to the frame up on the platform. If we did it on ground level, the window would be too heavy to hoist upwards. In the images below you can see how the frame is roped, then hoisted to the wooden platform. The location of Our Lady of Mercy Church is very public, with students, locals and tourist passing by. 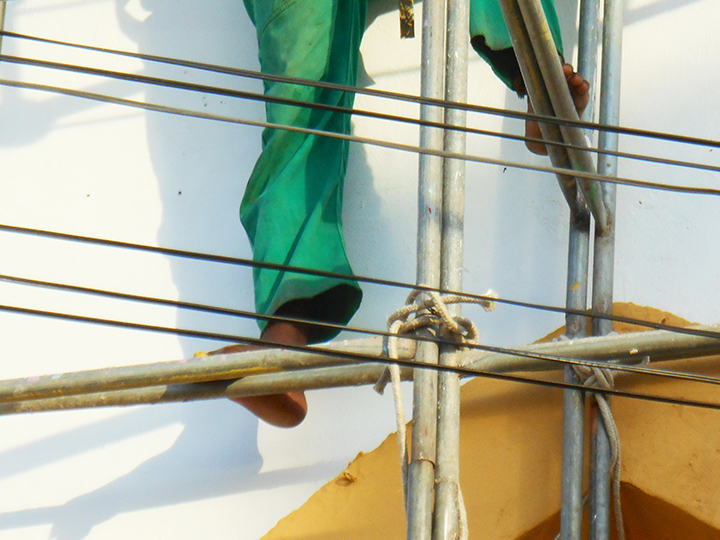 Filp-flops off, the bare feet of my assistants on the scaffolding. My assistants from the Sacatar Foundation, fit the work temporally into the opening and decide we need a few heavy duty bolts to better attach the frame to the wall. Measuring and drilling go on until our lunch break, and because of the heat, we decide to return at 3pm. We carefully hoist the 13 glass panels up to the platform, dividing them into four deliveries, then I climb up and join Charles Silva (of the Sacatar staff) and we meticulously connect the glass to the frame, using 66 bolts, our finger tips and a shared wrench. It is detailed work to do in the hot afternoon sun, and each added glass panel adds more weight to the structure. 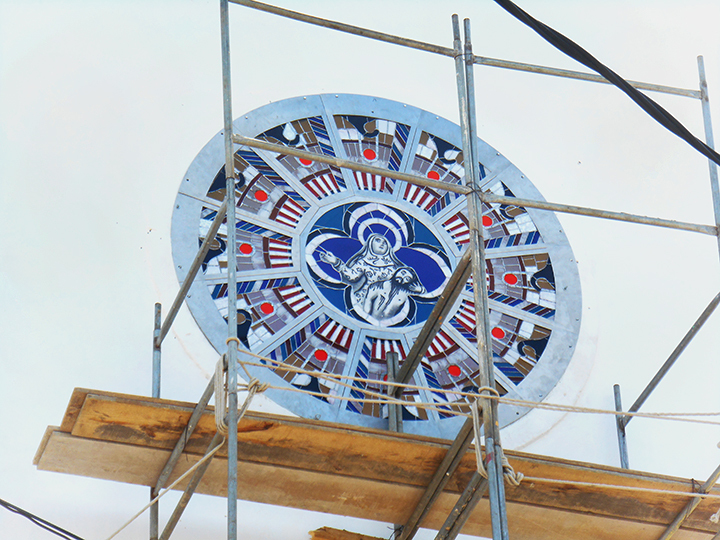 We carefully turn the large wheel of glass and metal securing more panels, until after 3 hours final central panel is in place. The work is now weighing 90 pounds (40kg). The center image below is yellow because of the light change; it is 6pm and the sun was about to set. Raimundo da Silva joins Charles and I to help hold the work in place, while I attach the LED lighting to the back of the frame. Now the three of us move the work towards the wall, while a fourth person joins us on the platfrorm. It is the electrician who connects the live wire line to the LEDs. The LEDs are set on a timer. It will light from 6:00pm to midnight every night. 7:00pm, by street light, we add the final connections securing the work to the church wall. Before climbing down, I am able to photograph Charles (below in red) and Raimundo in the last moments with Our Lady. Charles gives the image of Jesus a kiss before decending the scaffolding, and I give Our Lady a kiss as well. 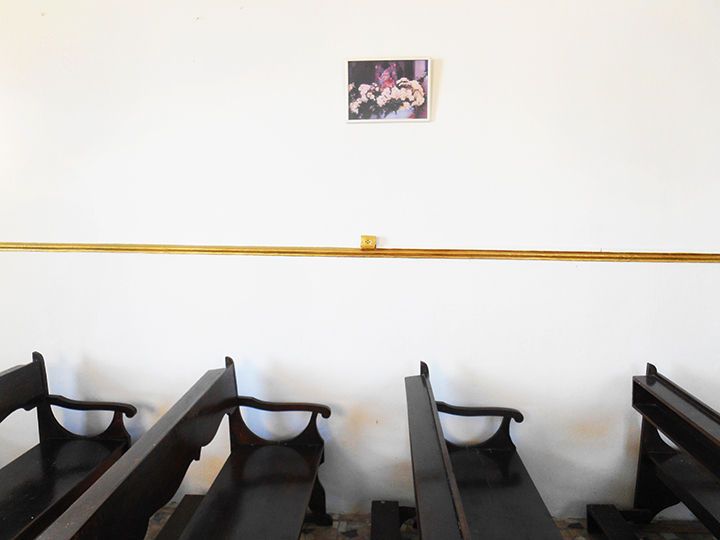 This framed xeroxed photo of the "Our Lady of Mercy" statue still hangs inside the church. It was placed there 6 years ago after the original statue was stolen. 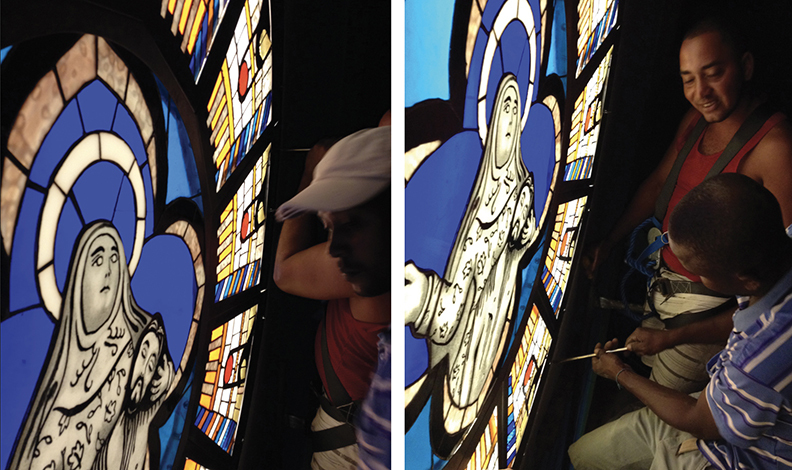 As of November 18, 2017, Our Lady has returned as a stained glass window, and overlooks the public square, the Bay of All Saints, and all of South America. 10AM the next morning I stop by and see the work in the daylight. 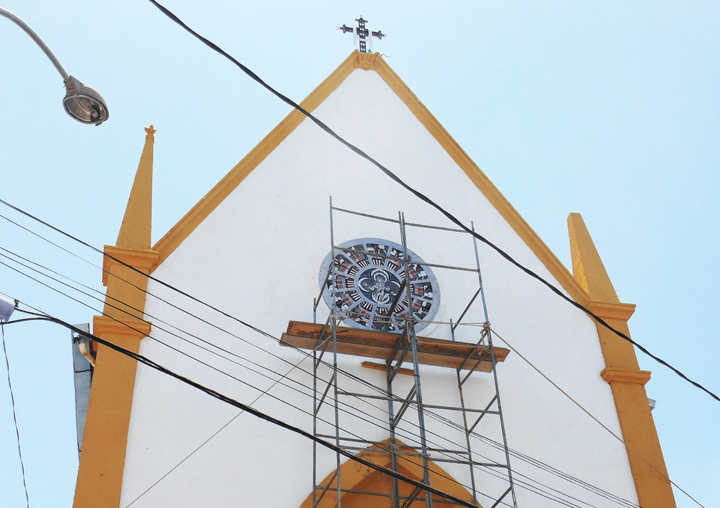 Soon the scaffolding will be removed and we will have a commencement to introduce "Return of Our Lady" back to Itaparica. ‘Return of Our Lady’ by day. Soon I will stop by at dusk to take photos for my next and most likely final blog of this project.